As a follow up to my previous post on Smule getting it wrong I must admit to giving in. I simply couldn't put up with the un-updated update. 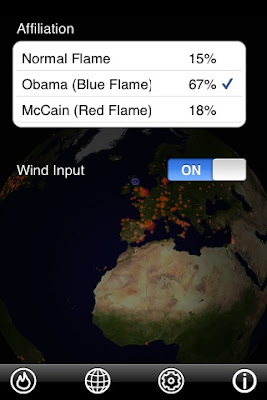 The Smule application shows that nearly as many people would rather burn a normal flame than vote for McCain. I cast a red flame to vote for the guy who didn't sing; "Bomb, bomb, bomb Iran". I think the application is interesting. In many ways it undercuts the very expensive polling systems in place in many Western Elections. Of course, Smule doesn't give me a way to change my vote nor do I expect it to offer a voting system for UK, Canadian, French, German or any other election. I don't imagine we're far from a future where mobile operators can sell data to show what a voting turn out was like (a percentage/number of mobile phones in a polling station) or even a way to let parties home in on voters who may not have made it to the booth yet. Can you imagine getting a SMS after lunch that points you you've not voted yet. It could happen. Whatever the case and despite Smule's attempt to get the balance right... I find the iPhone App marketplace to be a facinating landscape. I think an easy way to sum up the challenges the App marketplace faces is to quicky survey the number of tech blogs that describe AT&T as the sole network provider for the iPhone. They're not.